The sack of Rome in 1527, by Johannes Lingelbach. Johannes (or Johann) Lingelbach (1622–1674) was a Dutch Golden Age painter, associated with the second generation of Bambocciate, a group of genre painters working in Rome from 1625–1700. Lingelbach was born in Frankfurt, the son of David Lingelbach, a German technician, who in 1634 settled in Amsterdam with his wife and children. In 1638 the father hired and later established a labyrinth in the Jordaan. He furnished it with machines, that could move or play music and depicting biblical or mythological scenes. In the late 40s Johannes Lingelbach travelled to France (?) and Italy. After returning to Amsterdam, around 1653, Johannes married. Around 1662 Lingelbach lived in Reestraat, a small street near Prinsengracht; he became a close friend of Jurriaen Ovens. His work began to show an influence from Philips Wouwermans' landscapes. His skill in painting genre figures is no less accomplished in his depictions of architectural and natural objects. He was often invited to paint the figures and animals within other artists landscape pieces, such as the Dutch master landscape painter, Meindert Hobbema and Jan van der Heyden. His study of architectural forms came from observing the paintings of another Bamboccianti, Viviano Codazzi, an Architectural Vedutisti, or view painter. Lingelbach followed the style of the original Bamboccianti, Pieter van Laer, called Il Bamboccio, bringing his own Italianate style into influence of Northern European painters. He is one of the few Dutch painters of the Bamboccianti, whose works are documented in depth, making his influence greater in the progression of the style. 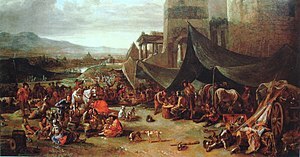 Some of his works in Rome were once attributed to Pieter van Laer, but are now rightfully claimed to be Lingelbach’s, such as his, Roman Street Scene with Card Players, (National Gallery). These works show the Italian influence of Caravaggio in their realism and refined chiaroscuro effect, also seen in works such as Lingelbach's, Figures before a Locanda, with a View of the Piazza del Popolo, Rome, (Royal Collection). Lingelbach died in Amsterdam. Lingelbach’s forms were accomplished in there effects of light and spatial accuracy, but much freer than that of Codazzi. Battle of Milvian Bridge, c. 1650. Flemish Town Sieged by the Spanish Soldiers, c. 1674. ^ ""Johannes Lingelbach", The J. Paul Getty Trust". Archived from the original on 2011-06-07. Retrieved 2007-07-26. ^ a b "Web Gallery of Art, searchable fine arts image database". ^ "Web Gallery of Art, searchable fine arts image database". ^ "Possibly by Jan Lingelbach - Roman Street Scene with Card Players - NG6640 - National Gallery, London". Archived from the original on 2007-09-29. ^ "Battle Scene (Getty Museum)". ^ "Jan Lingelbach - Peasants loading a Hay Cart - NG837 - National Gallery, London". Archived from the original on 2007-09-29.